If you live or own property in the High Country areas of Linville, Banner Elk, Boone, Blowing Rock, Valle Crucis, and Newland, you know that a thunderstorm can arise at any time with little warning. During the warmer months of the year especially, lightning can be present during these storms. Lightning is more threatening if you have a number of trees on your property that lightning will be attracted to. Trees are full of water and are excellent conductors of electricity, making them a prime target for lightning during a storm. When lightning strikes a tree, it typically does so near the trunk as the trunk contains the most water. The electricity can surge through the tree trunk and blast the bark of a tree to shreds. Tree limbs often break apart or trunks sometime split and pieces of the tree can be thrown over a hundred feet or more during a lightning strike. Property owners can protect and potentially save their trees, even those close to your home or other structures by allowing us to install lightning rods. Lightning rods are simple devices that are highly effective in protecting trees from this type of storm damage. Typically, lightning rods are installed in a tree so that if the tree is struck, the metal of the rod instead of water found in the trunk of the tree conducts electricity. The rod guides electricity down the tree trunk to the earth, thus saving it from injury or explosion. We can help you decide which trees will benefit the most from the installation of lightning rods for protection. 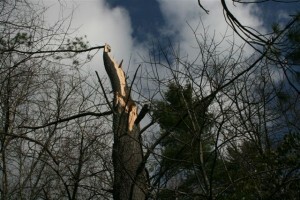 Certain species and certain tree heights are more susceptible to damage from lightning. Trees that are close to your home or structures would benefit by having lightning rods installed. Contact us about providing lightning protection for the trees on your property. Let us provide you with an estimate for protecting your valuable trees.